Think of the Kona Hei Hei CR/DL as an XC bike on steroids. You get all the speed and climbing prowess you would expect from a XC bike, but when it’s time to point this bike downhill, you will know you’re on a bike that is so much more. The Kona Race Light Carbon is lightweight, but strong as all get out. You will never feel like you need to tip toe around while you’re riding the Hei Hei CR/DL. 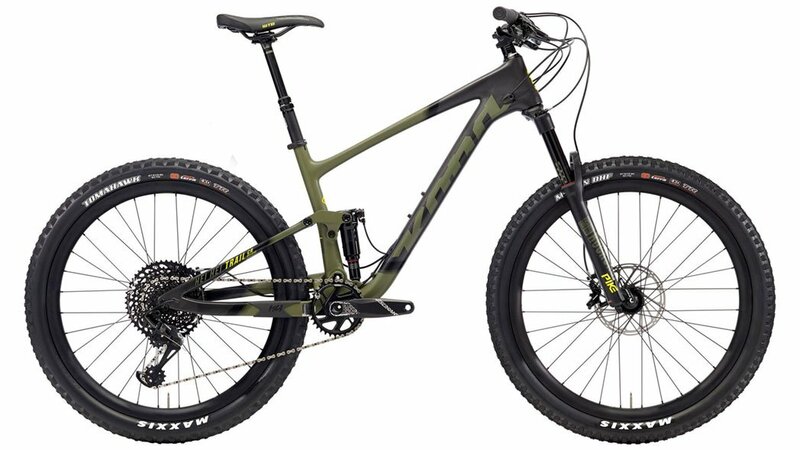 The Kona Fuse suspension platform with the Rock Shox Deluxe rear shock provides efficient pedaling while remaining plush through the chatter, and then really starts to shine as the bumps get bigger. The 140mm Rock Shox Pike up front will smooth out the roots, and gobble up gnarly rock gardens. The boost rear end provides additional clearance for tires, more precision and removes unwanted flexing. The Descendant crankset combined with the GX Eagle 12-speed drivetrain will keep the pedals turning and reward the rider with smooth accurate shifts. 27.5 wheels are big enough to supply that roll over anything feeling while remaining nimble through tight switchbacks and technical sections. Keeping it all under control are SRAM's Guide R brakes. The Hei Hei CR/Dl Trail is an unrelenting pursuit to push the limits of what a bike can do. It is perfect for the endurance racer, weekend warrior, or experienced trail rider that wants a fast, go anywhere trail crushing machine that will turn your rides up to 11.